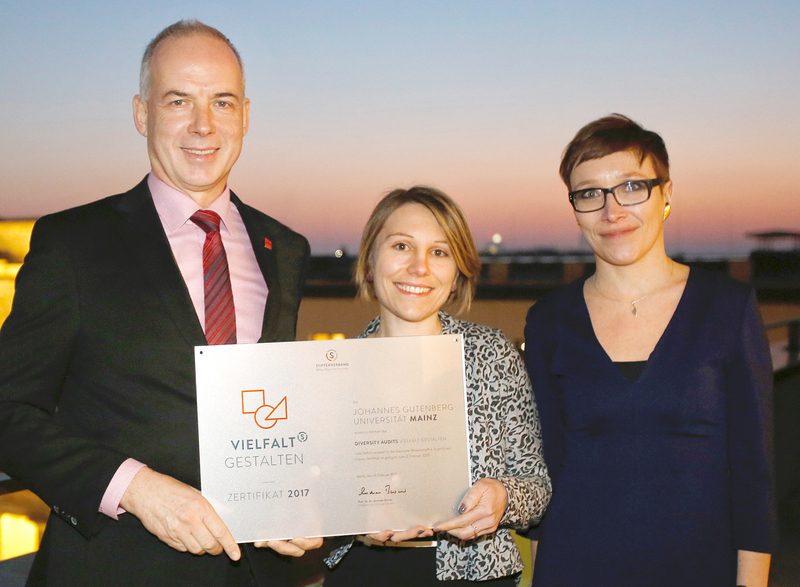 Johannes Gutenberg University Mainz (JGU) received the Shaping Diversity certificate within the framework of the Stifterverband's Diversity Audit process. This accreditation recognizes Mainz University's efforts in establishing a diversity-oriented university culture. JGU is thus among the 25 German universities that have successfully completed the process; another 19 universities are currently taking part in the audit. The aim of the Stifterverband's Shaping Diversity audit is to enhance equal opportunity in higher education and to ensure that admission to university and success in obtaining qualifications is not determined by the students' cultural or social origins, their educational or experience backgrounds or their life circumstances, but only on their individual motivation and performance. "During the audit process, we gained considerable and valuable insights, in particular with regard to our core area of interest, i.e., equal opportunities in education. We have made considerable progress towards achieving our goals, part of which is to ensure the full and equal participation of all members of the university in university processes—regardless of age, gender, social and ethnic origins, religion, sexual identity and orientation, physical abilities, or individual lifestyles," emphasized University President Professor Georg Krausch, who actively participated in the JGU Diversity steering group. "For us, the Stifterverband Diversity Audit provided an introduction to an aspect we intend to continue to place considerable stress on developing in coming years, also with regard to other target groups, such as our academic and administrative staff," added Krausch. The purpose of diversity-related activities is not only to provide a level playing field but also to ensure that the multi-faceted needs, situations, and preferences of students are given increased consideration in higher education teaching, in exam situations, in administrative processes as well as in everyday university culture, and can thus be appropriately given the appreciation they deserve. Both the possibilities for using the potential generated by diversity as well as the establishment of equal opportunity were guiding principles for the development of the first action packages within the framework of the audit. In view of the increasing diversity of the student body and the consequences of this with regard to teaching and learning, the focus at JGU will remain on the creation of a diversity-oriented, inclusive teaching and learning culture. Support and continuing education options, tools, and formats have been and continue to be developed that are designed to help teaching staff deal with the increasingly diverse landscape of students. A new Diversity Coordination Office will continue and extend the concepts initiated within the framework of the audit in the coming years. In the next phase, Johannes Gutenberg University Mainz plans to draw up a Diversity Guideline through a broadly-based consultation process that will both provide all members of the university with orientation help and define the strategic development goals and associated activities to 2020.